WE SAY: Rides better than a Jazz. Rips up the track. 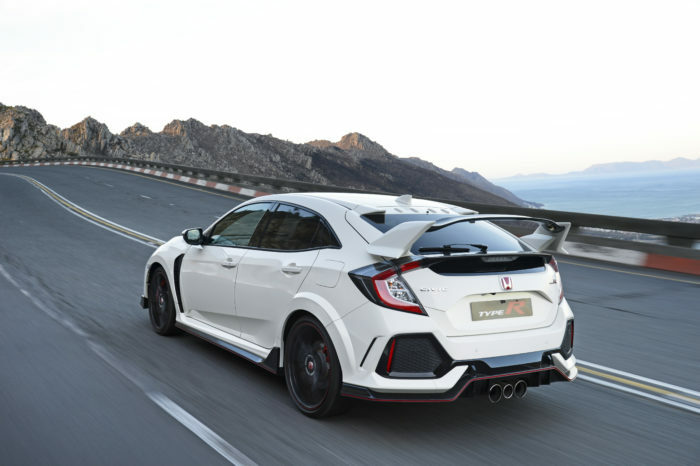 Ah yes, and there’s no subtle, wing-deleted version on sale either so Civic Type R comes standard with all these quintessential (functional) ‘import’ mods already pasted on. Think of it as the replacement patina to the defunct Mitsubishi Evo and Subaru WRX STI and stuck in a time when DSG gearboxes and all-wheel drive hatches are the norm. It’s proper nostalgia. Now every competitor claims that their styling is functional and I bet if you omitted some of the vortex generators there wouldn’t be two long skidmarks that disappear into the scenery at turn 1. But would you want to mess with an exact science, one that has promoted the Civic Type to the top of Nurburgring’s front-wheel drive hatches? Is that exhaust setup inspired by the Ferrari 458? Yes and like both their outgoing models, it’s one fewer. Three is the new four. Honda’s primary reason for the middle resonator pipe is to reduce that monotonous humming at cruising speed that afflicted the previous version while sounding more sincere than those blipped unshifts from a Golf R or Audi S3. Honda builds the best (6-speed manual) and worst (CVT) gearboxes. In lieu of a DGS, the Civic’s is the same short throw perfection that catapulted the S2000 into sportscar fame with a linkage chain from ethereal elements. Drop a few gears before the corner and the new Civic will rev-match for you or you can turn it off and double de-clutch it. And a Sport and Race mode. The big revelation is with the adaptive dampers. Now you can drive through Mpumalanga in Sport with the car’s chassis rising and falling intuitively. It’s not far off a Honda Jazz in comfort. Race mode nibbles a bit harder at the surface but the dampers and multi-link rear suspension compared to the previous torsion beam setup, have transformed this car. Can I order it without the red interior? This is likely to be as contentious as the exterior and one of the many reasons why Honda predicts the typical buyer to be in his thirties. For a change the ‘fast bits’ are not characterised by carbon fibre and the steering wheel doesn’t have a flat edge. Underneath all the racecar vibes is a very sensible hatch with a large boot and good rear space. It’s a fascinating contradiction that is impossible to stick into just one box. Honda isn’t expecting to shift big volumes of this but NSX excluded, the brand needs a halo model because it’s got CR-V (boring), HR-V (slightly less boring) and Honda Brio (practical but ugly), Jazz (not as good as the original) in its portfolio. The Civic is TopGear’s Car of the Year, Performance Car of the Year and Editors’ Car of the Year, finally priced where it always should have been.